If you're like a lot of Utahns, you're ready to get outside, enjoy some sunny weather and catch some fish. As you make plans for Memorial Day weekend, biologists with the Division of Wildlife Resources have some "inside information" to share about fishing waters you might want to consider visiting. Randy Oplinger, sport fisheries coordinator for the DWR, says Utah has literally hundreds of fishing waters. "It can be challenging to pick a water that best meets what you're looking for," he says. "Fortunately, our biologists know these waters like the backs of their hands. And they're happy to provide direction." Oplinger says many anglers are looking for one of two things: a close-to-home water that provides them and their kids with a good chance to catch fish, or a water that provides good fishing in a peaceful and quiet setting. From Memorial Day weekend through the end of June, the following waters should be the very best waters to fish in Utah this year. Oplinger places the waters into two categories: "best family fishing waters" and "places to fish and get away from it all." 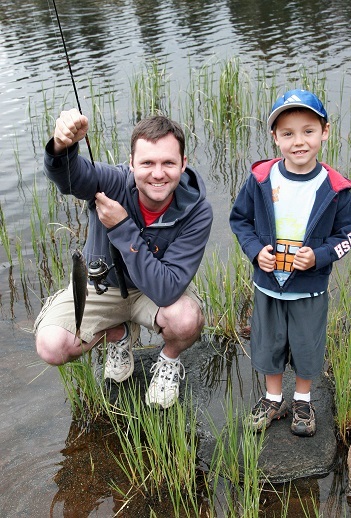 "Early summer is the perfect time to get outside and fish with your family," Oplinger says. "And it doesn't matter if you're an experienced angler and members of your family are just getting started. Many lakes in Utah provide fishing opportunities that can be enjoyed equally by anglers with various levels of experience." Oplinger says many of these waters are near some of Utah's largest cities. That makes them great places for a quick afternoon trip. "Other waters have campgrounds," he says, "which makes them a great place for a weekend getaway. Several of the best, family-friendly waters have nice fishing piers, restrooms and boat ramps." Mantua and Willard Bay reservoirs are north of Salt Lake City. They're among the closest places to the state's capitol to catch bluegill and channel catfish. Oplinger says Mantua provide should provide great bluegill fishing during early summer this year. "Bluegill are a great fish for kids to catch," he says. "They'll take just about any bait or lure. And, if you find a school of them, you can catch a lot of fish." Oplinger says channel catfish numbers appear to be up at Willard Bay this year. "I think this will be a great year to fish for channel catfish at Willard," he says. The Manti Mountains are nestled east of the Sanpete Valley in central Utah. The small lakes on the mountain are great places to catch colorful brook trout. "The lakes aren't heavily fished, either," Oplinger says. "Those who fish them find privacy, good scenery and lots of great fishing. Several all-terrain vehicle trails are also located in the area. If you have an ATV, consider bringing your fishing gear with you and enjoying time at one of the lakes." If you live in northeastern Utah, you have quick access to five of the best family fishing waters in the state. "These five waters are great family-fishing waters because they're places where everyone, regardless of their fishing experience, can catch fish," he says. "Experienced anglers and new anglers can have a great time catching fish together. Both bait and lures work at these waters, and shore anglers can catch a lot of fish." The species available to catch also vary greatly among the five waters. "Depending on where you go," he says, "you and your family might catch trout, bass, bluegill and even tiger muskie." Lost Creek Reservoir, located near Morgan, is less than 90 minutes from Salt Lake City. It's not heavily fished, and lots of large cutthroat and rainbow trout are available to catch. The Uinta Mountains are also a great place to take a hike and catch trout in beautiful, high-country lakes. Ironically, Flaming Gorge is one of Utah's most popular reservoirs, but it's also a place where you can find solitude. "If you have a boat," Oplinger says, "it's easy to motor out into the reservoir and get away from everyone else. May and June are great months to catch rainbow trout, lake trout, kokanee salmon and smallmouth bass at Flaming Gorge." Two other waters in northeastern Utah-Long Park Reservoir and Spirit Lake-also provide solitude and plenty of rainbow trout to catch. Down south, Navajo Lake and lakes on the Boulder Mountains are Oplinger's top picks for southern Utah. "Navajo Lake is about 45 minutes east of Cedar City," Oplinger says. "Fishing for splake-a cross between a lake trout and a brook trout-can be great at the lake in June." The Boulder Mountains are another place to visit this summer. "The Boulders offer three things: colorful brook trout, beautiful scenery and very few anglers," he says. Oplinger says some of the waters on his list are close to home while others are perfect places for a weekend trip. As you scanned through the list, you may have noticed waters you're not familiar with. You can learn more about them at www.wildlife.utah.gov/hotspots. When you arrive at the webpage, click on the water you're interested in. In addition to receiving a fishing report, you'll also receive information about the water itself, including how to reach it, the type of facilities you'll find and the fish you'll likely catch. In addition, four of the waters on the list-Currant Creek, Flaming Gorge, Steinaker and Willard Bay-are Blue Ribbon waters in Utah. You can get detailed information about them by visiting the DWR's Blue Ribbon page at www.wildlife.utah.gov/hotspots/blueribbon.php. Once you arrive at the page, click on any of the waters. Visiting www.wildlife.utah.gov/hotspots is also a great way to stay up-to-date on fishing at the waters. If you'd like to receive the fishing reports via email, that's possible too. You can subscribe to them at www.wildlife.utah.gov/about-us/subscribe-to-updates.html. Two additional websites-bigfishtackle.com and utahwildlife.net-also provide current fishing information for waters across Utah. If you're new to fishing, you can learn the basics online. One of the best websites to visit is Take Me Fishing.org. To learn how to fish, or brush up on your skills, visit www.takemefishing.org/how-to-fish/how-to-catch-fish.